Julian Assange at the embassy in 2016. Moreno views Assange’s status as a problem granted to him by his predecessor, Rafael Correa, and pressure for him to resolve it has been building for some time. In March, the embassy cut off Assange’s internet access, saying he had violated an agreement to not interfere with Ecuador’s international affairs—possibly referring to his relentless (and insufferable) tweeting, attempts to secure the goodwill of Donald Trump Jr., support for Spain’s Catalan independence movement, and increasing alignment with a bevy of far-right fringe figures like European nationalists. Downing Street confirmed to CNN that diplomatic discussions to guarantee Assange’s safety were “ongoing,” though ultimately what kind of concessions he could receive or how British officials define safety remains unclear. 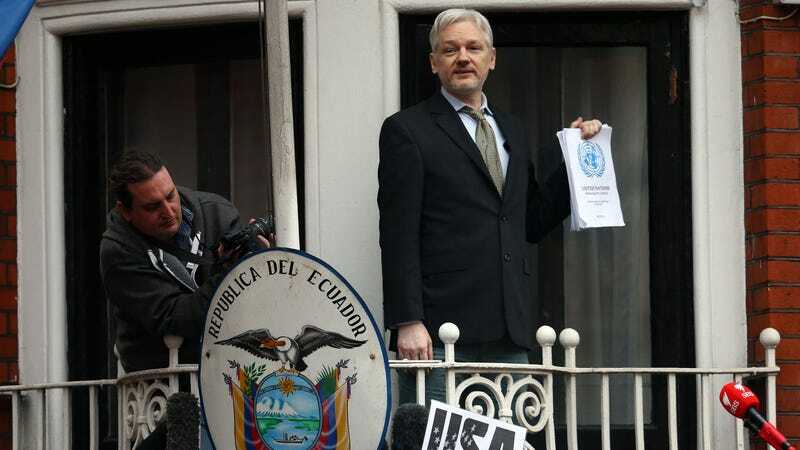 For example, confirmation that he would not receive the death penalty or be tortured may not count for much if neither of those things were likely to happen to him if extradited to the U.S. Further complicating discussions is Assange’s Ecuadorean citizenship, which he was originally granted in a fruitless attempt to allow him to leave the embassy unimpeded. It’s possible that rumors of Assange’s imminent exit are part of a pressure campaign by various parties with an interest in determining what happens to him after he is forced to leave the embassy. That said, it is also possible Assange could be kicked out at any time, with or without any deal in place.